Sector rotation is the normal evolution of different industry groups to a recovering and expanding economy. It is also affected by investors trying to anticipation this expansion. Chart 1 illustrates the usual rise and fall of different key industry groups. 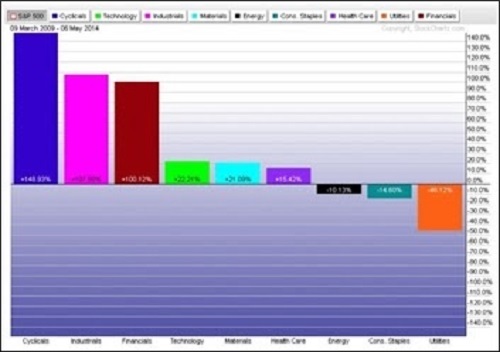 In a bear market (declining stock market and economic contraction), most sectors pullback, however, defensive industry groups such as consumer staples, pharmaceuticals and utilities typically display greater relative performance. As the low in the equity markets arrives, investors quickly move into the early responders. Sectors such as the financials, consumer discretionaries and transportation are usually the first to profit from a bottoming market and the anticipation of a soon-to-be recovering economy. With the stock market and the economy beginning to rebound, investors are focusing on industry groups that can quickly turn profitable after the economic contraction. After the financials, consumer discretionaries and transportation sectors, the technology, services and construction groups are typically the next industries that become profitable with a rebounding economy. The late contraction and early expansion phase is usually about six to eight months. 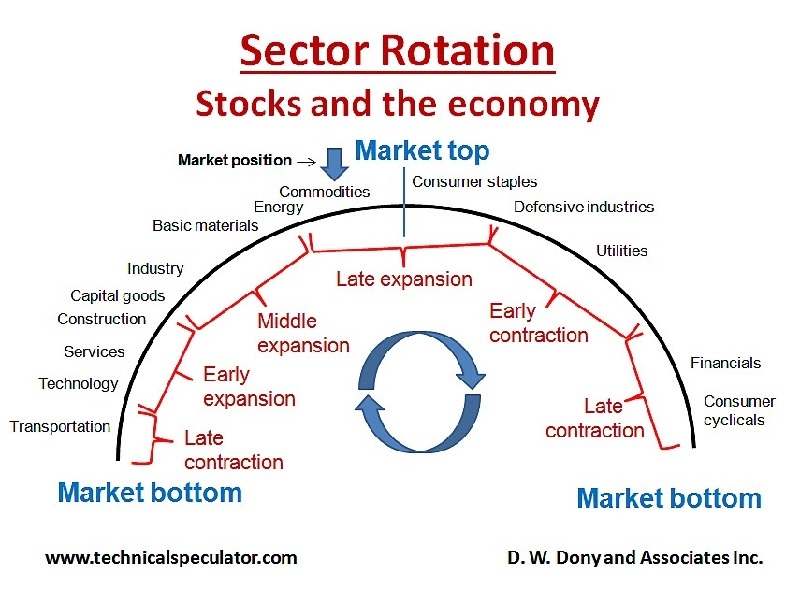 With the economy and the stock market on solid footing, sector rotation enters the middle expansion stage. This phase is often the longest and can last 2-3 years. Industry groups that display stronger growth during this segment are capital goods, basic industry and materials (building supplies, lumber and base metals). However, as the economy and stock market enters the late expansion or last phase, there is another change to investor’s attitudes. During the bull market, investors typically focused on either business groups that would profit from the current phase of the economy or try to anticipate sectors that would benefit from the next stage of the market. However, during this phase, capital flows begin to divide between sectors that profit from a very mature (late expansion) economy and a potential peak (defensive). This is where we are now. The current bull market and business cycle began in 2009. Throughout the next five years, sector strength has been in financials, consumer discretionaries, industrials, technology and healthcare. The weakest performing sectors have been energy, consumer staples and utilities (Chart 2). However, in early 2014, a dramatic shift occurred. 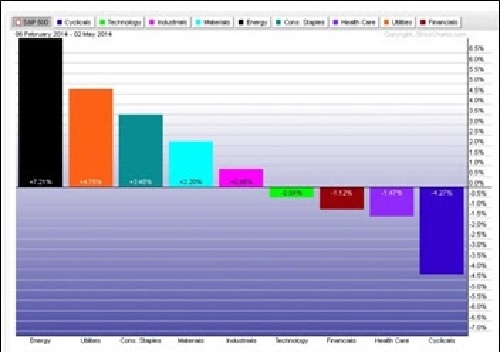 Energy, utilities, consumer staples and materials had become the best performing sectors and the normally strong industry groups such as consumer discretionaries (cyclicals), healthcare, technology, financials and industrials were the lowest performers (Chart 3). The late and final expansion of the economy and bull market has begun. This last phase is normally measured in months and not in years. Energy should continue to show greater relative performance over other groups, however, as this last phase progresses defensive sectors (consumer staples and utilities) are anticipated to gradually outperform.